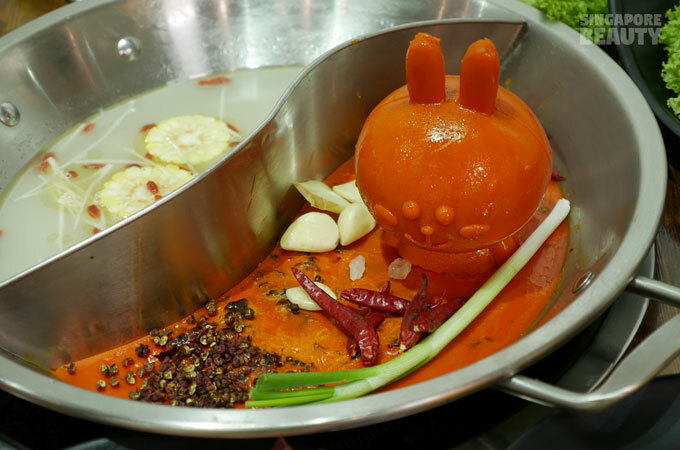 JiangHu Hotpot is a newly opened ala carte Sichuan hotpot with interesting food presentation fit for the royalties, arcade games, claw machine, minimart and a tea appreciation corner. With over 130 games available, you will be able to entertain the fussy babies in your group and keep them at bay while you enjoy your meal. 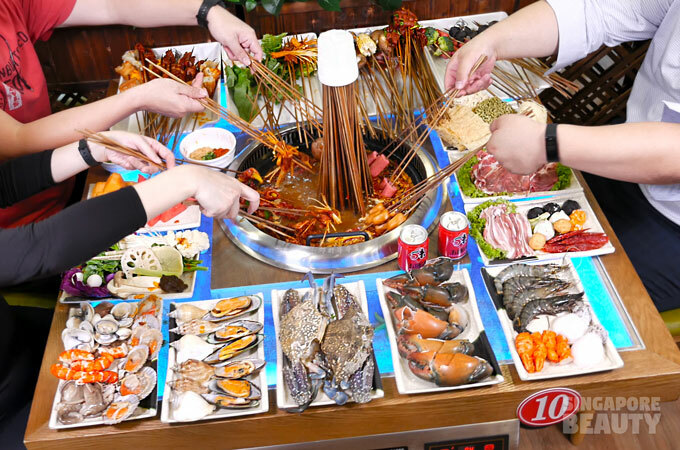 Game is free of charge and token will be provided by the service crew as part of the JiangHu Hotpot experience. 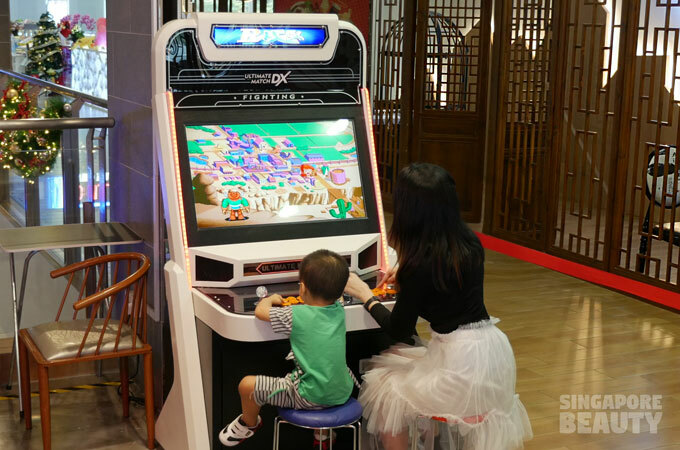 It is time to show your “Kung-Fu” at JiangHu hotpot’s arcade machine. Try your hands at the sure-win claw machine and walk away with amazing gifts redeemable at their cashier. By sure win, that means even if you did not manage to catch a ball on your first attempt, they will let you try till you did. Walk away with a 50% off voucher or other secret gifts up for grabs. 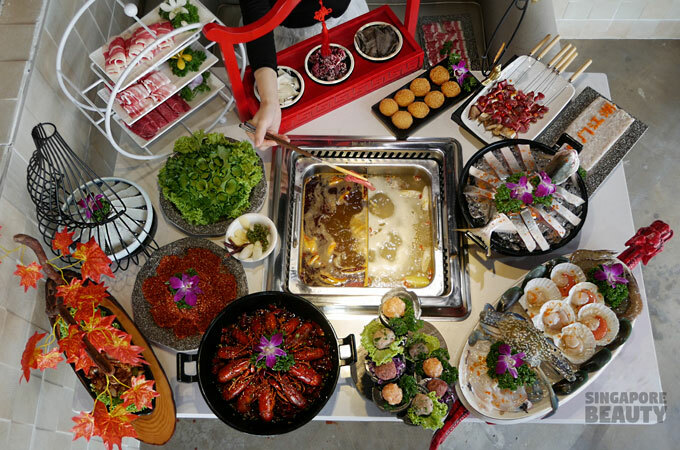 But why a minimart in a hotpot restaurant? 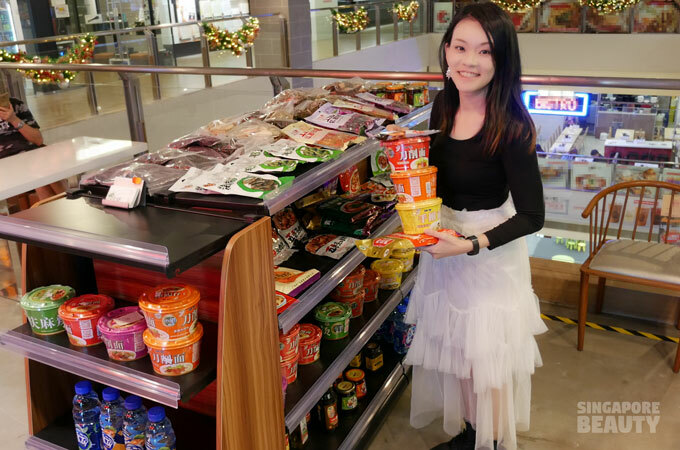 The restaurant owner is an importer of snacks, tub noodles, Sichuan condiments, ready-to-cook sauce kits, fruit flavoured mineral water, nuts, spices, herbs and pickles. A quick check of the price of laoganma sauce here is priced at $2 each instead of the $2.30 to $2.60 price range found online and in supermarkets. How about some unique instant knife cut noodles （刀削面） in flavours like pickled spicy beef and mala beef? 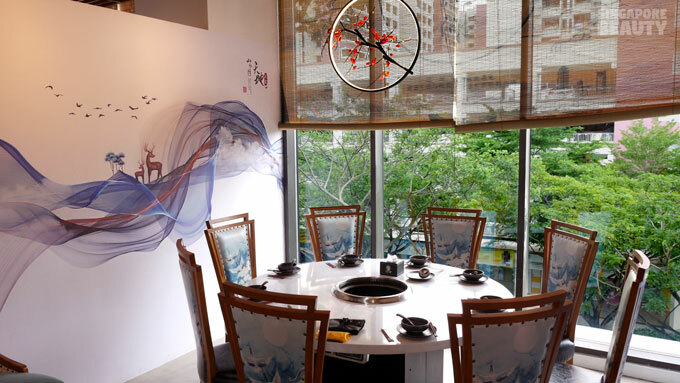 A tea appreciation corner greets you at the entrance. 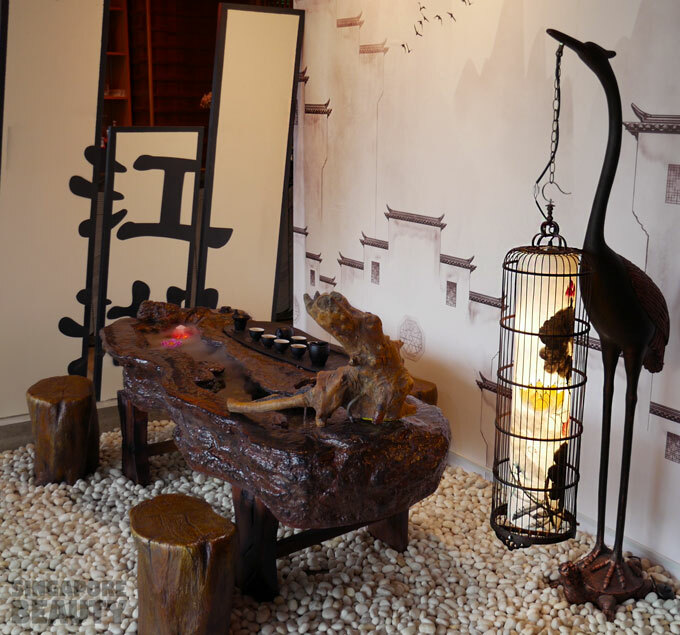 You may sit here to enjoy a cuppa of hot fragrant brew on a Chinese ceremonial tea table with tree stumps as seats and massage your tired soles on a bed of cool white pebbles. Chill out with the coloured crystal cascading in a river of cold mist. 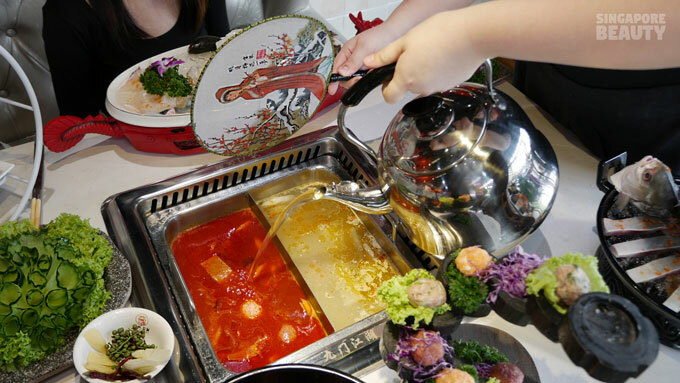 Make peace with yourself after a chaotic day before you move on to enjoy your hotpot. 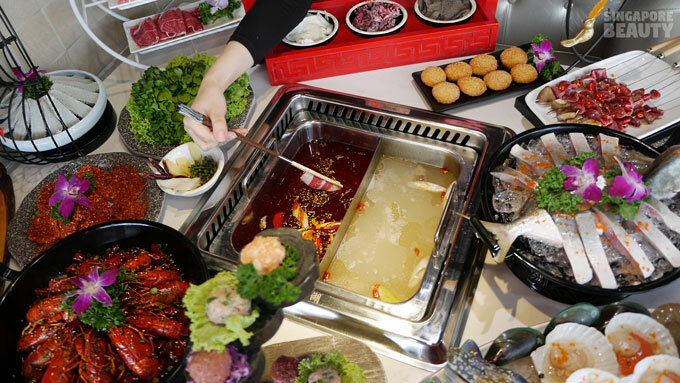 This is how JiangHu Hotpot came about – the story behind the rise of hotpot in Sichuan China and how an authentic hotpot should be. 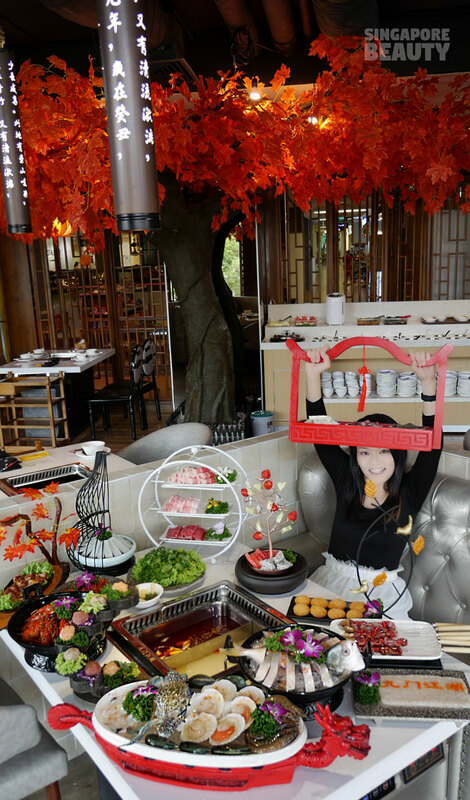 Operating principles Jianghu Hotpot strives to uphold. 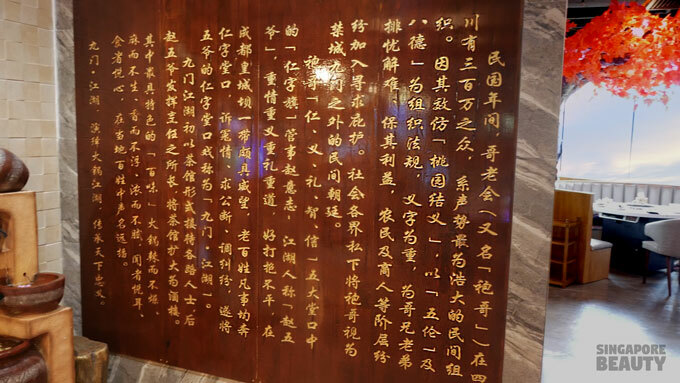 This interesting read prepares you for the restaurant’s Chinese architectural décor and the imperial-like food presentation to come. 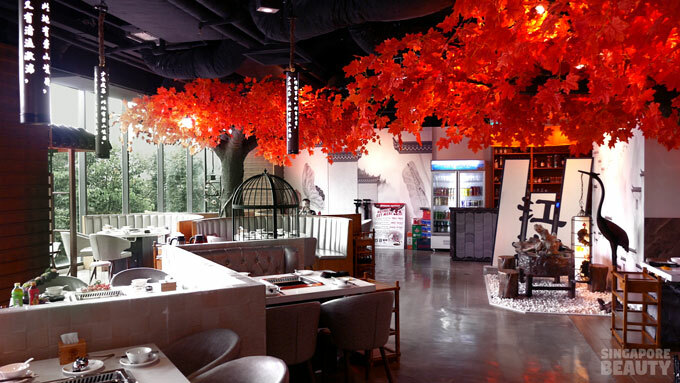 The restaurant is an autumn courtyard setting with “pavilions” by the windows with lush tree tops and naturally lit tables. Four set of private rooms (can house up to 10 pax or more) are arrange in a longitude way with sectionalised overhanging gable roof and wood carved lattice view windows. 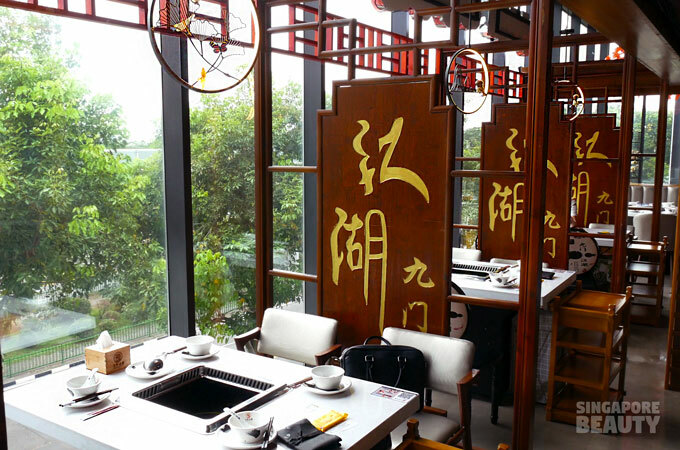 Inn-like rooms with high-back landscape printed chairs, calligraphy white washed walls with daylight filtering through the bamboo blinds. 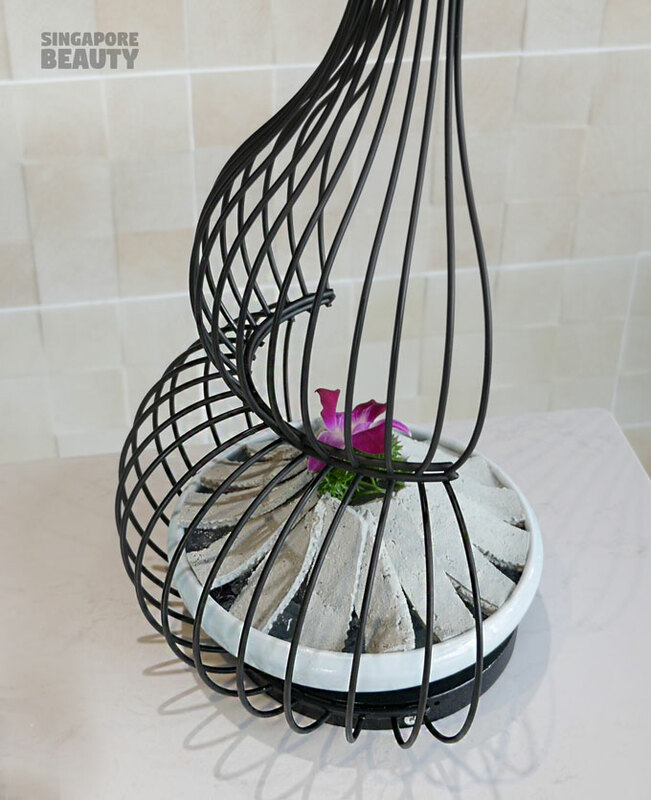 The settings in these rooms are more formal and great for private functions or gatherings. The main courtyard space is peppered with high back sofa and couch for 4 pax or more. The poetic interior is like autumn overflowing with fluttering golden crimson red leaves, sounds of flowing stream and lanterns inscribed with poems hanging from the trees. The red somehow brings to mind – romance and royalty. 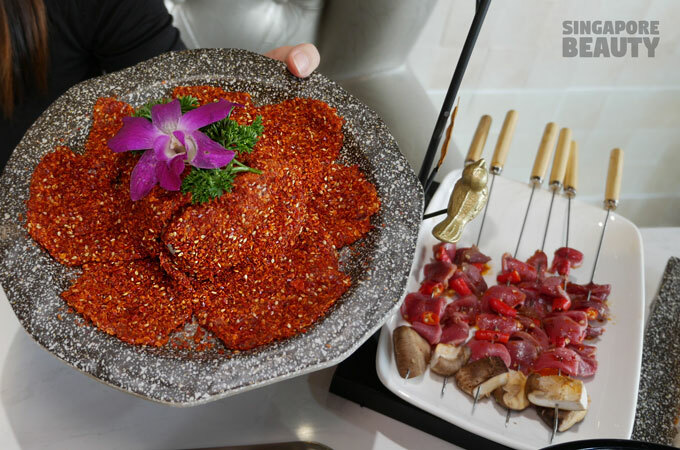 With over 190 selections from soup bases, mains, meat, greens, Sichuan dishes, nostalgic snacks, beverages, alcohol, minimart snacks and set meals, you will be feasting like a King. 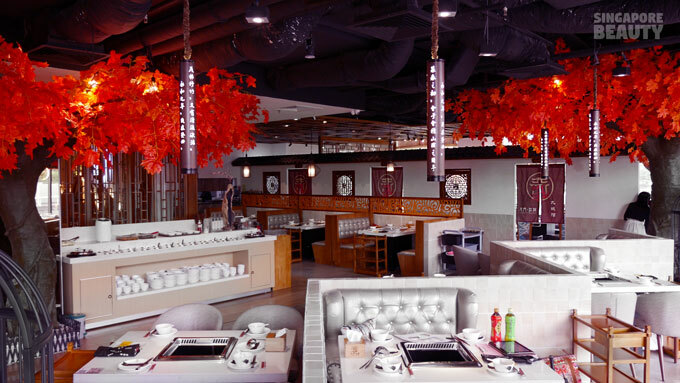 This place is set like an Imperial Chinese drama with food décor that seems to say the obvious too. 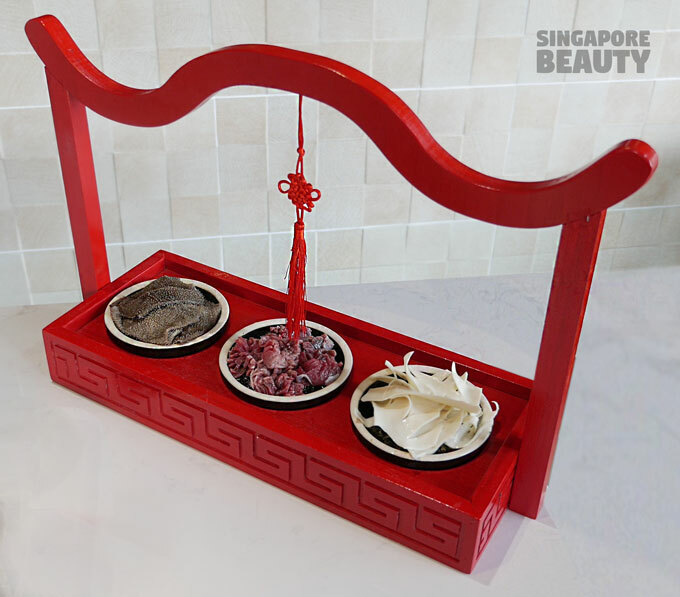 Mixed organs of pork and beef innards served in a dainty red craved wood food carrier. 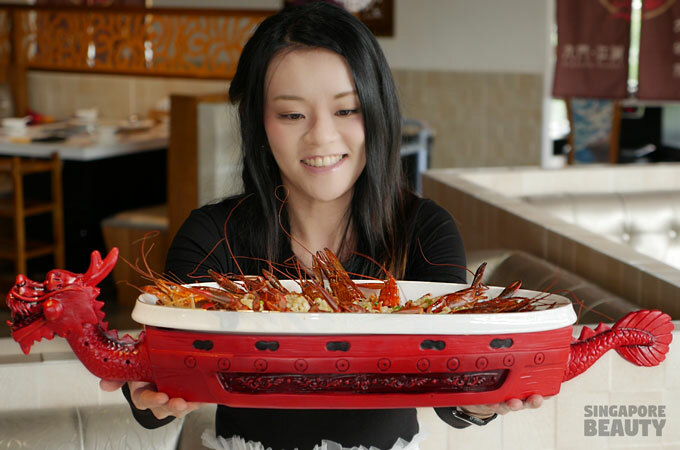 Steamed garlic crayfish in superior broth served in a smoking dragon boat. 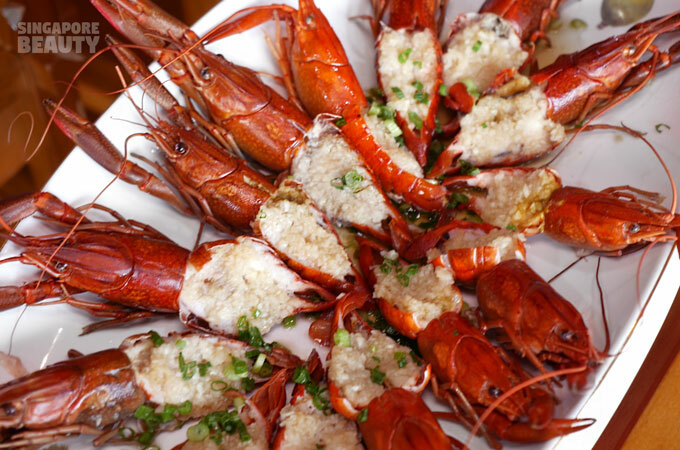 Tuck into these succulent butterflied crayfish with morsels of savoury meat and saline burst of garlic that melts in your mouth. 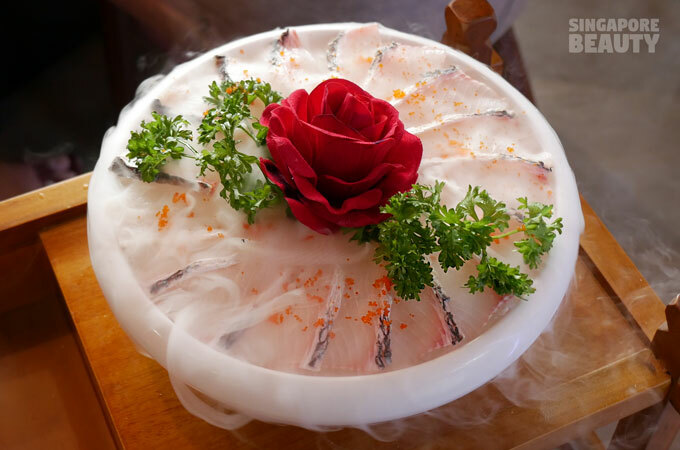 Sliced fish on ice – These slices of fish are served on a bed of ice on a smoking bowl stand topped with a real rose and parsley. 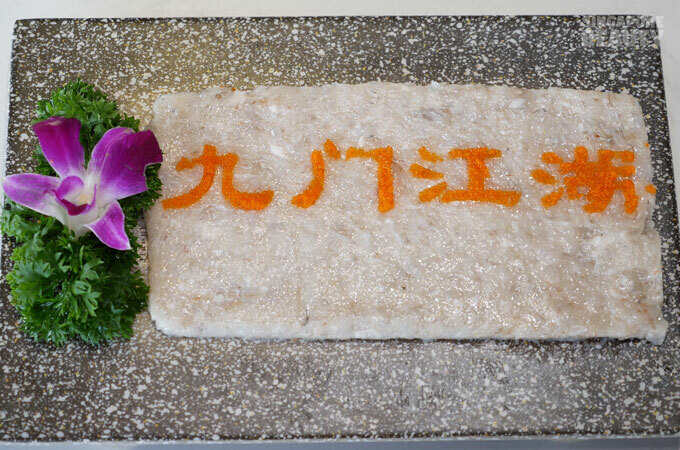 A pretty and romantic way of presenting these sliced fish. 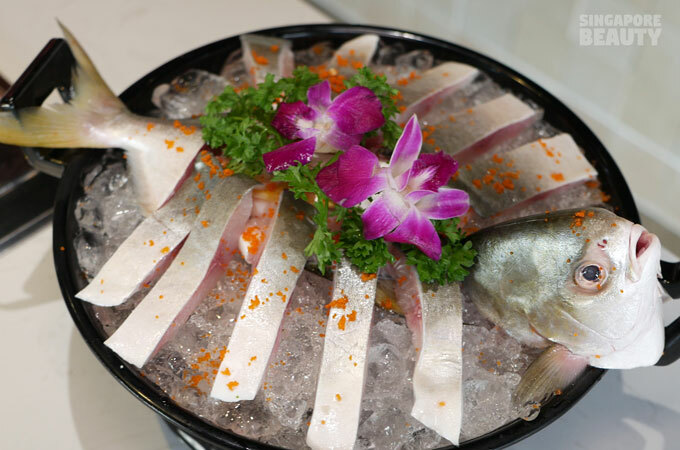 Sliced fish turns a snow white shade when cooked with a briny and delicate texture. 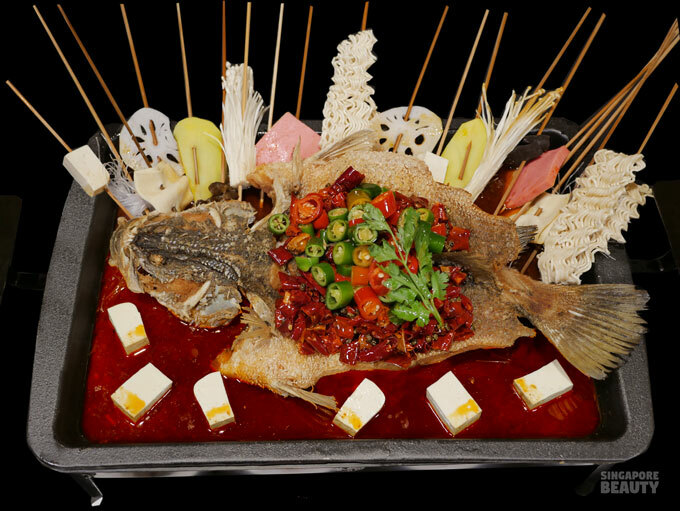 How about a whole golden pomfret served on ice so nothing goes to waste? This fish is filleted and served whole with the head, rib bones and fillets for ease of consumption. Add in the rib bones with the fish head for a more flavourful, milky and rich soup base. 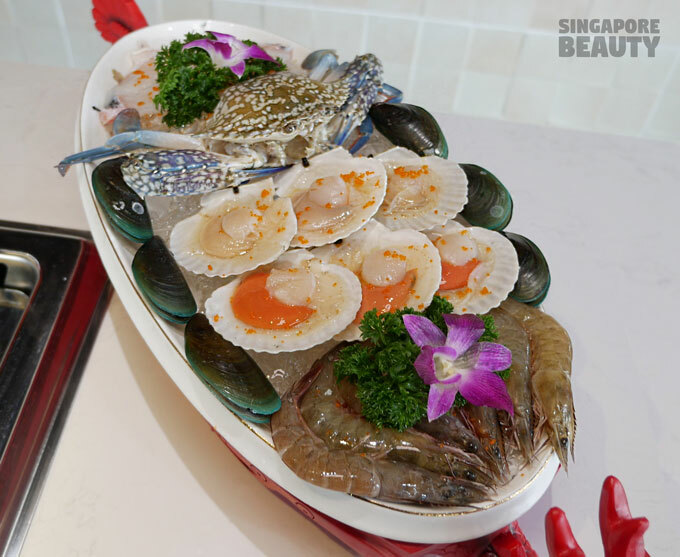 For seafood lovers, try the seafood platter served on smoking iced dragon boat with an assortment of prawns, scallops, mussels, flower crab and sliced fish. 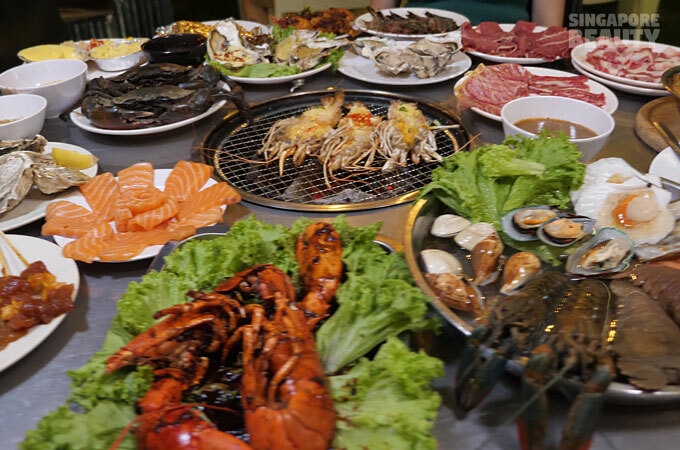 Watch the cooking time for these seafoods to retain their succulent texture. Scallops and prawns are of a good size. 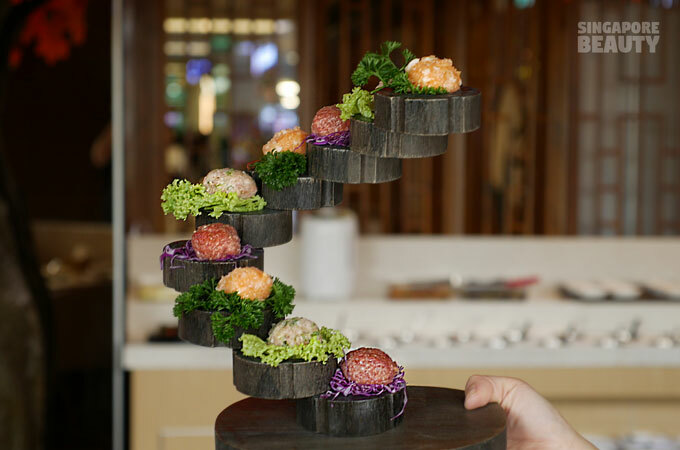 Cascading mixed meat balls combo consist of handmade fish mentaiko, pork coriander and lamb paste meat balls. These meat balls are great for the hotpot and balloons to 1.5 times the original size when cooked. Mentaiko fish ball has a rich taste and springy bite. These are ready to eat when you see them bobbing up and down in the soup. 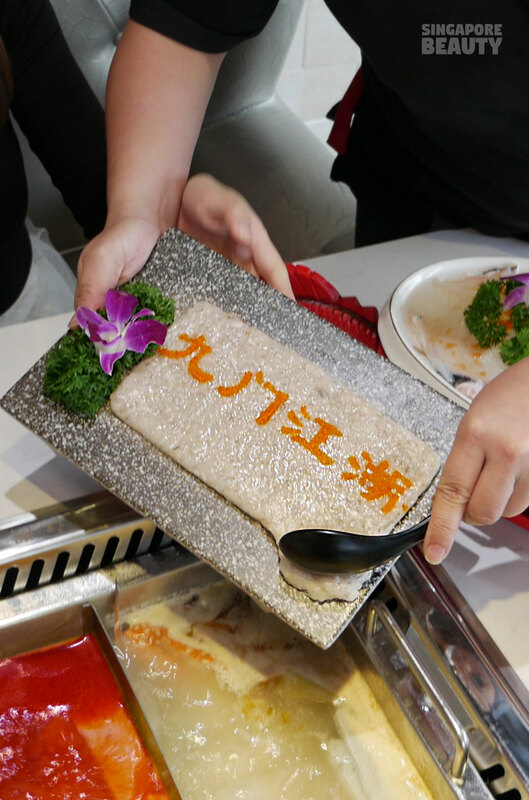 Signature prawn paste – An interesting handmade minced prawn paste inscribed with the name of the hotpot using capelin roe. The service crew will assist to cook this prawn paste into springy rolls of prawn cakes with real chopped chunks of prawns. I am in love with the texture of these prawn cakes with creamy saucy roes. 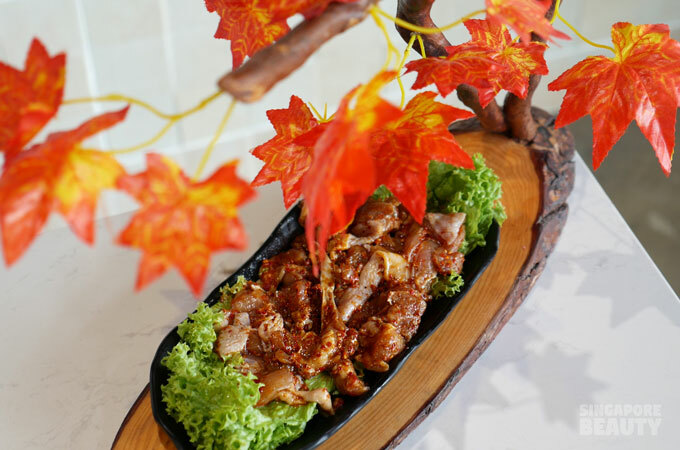 (Autumn leaves) Signature chicken chunks are tender chicken chunks marinated with spices. 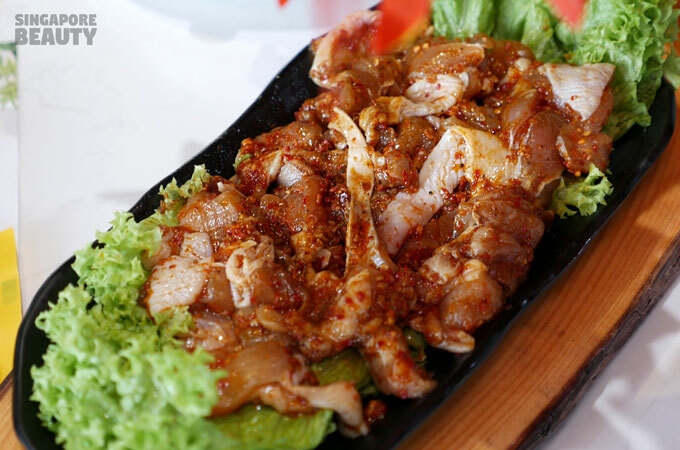 These chunks of skin on chicken remain tender after cooking due to the method of marinade and cuts according to the service crew. 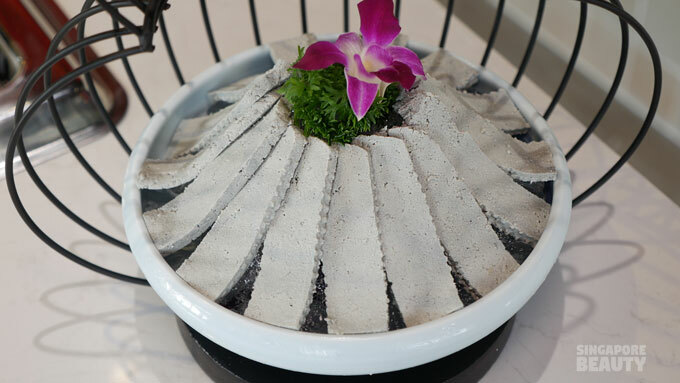 Handmade black soya bean tofu- made in house from scratch with black soya beans native to China. These black soya beans are believed to be great for purging toxins from the body in the field of Chinese medicine. This handmade black soya bean tofu has more body, creamier and custardy texture compared to those bought from retail store. 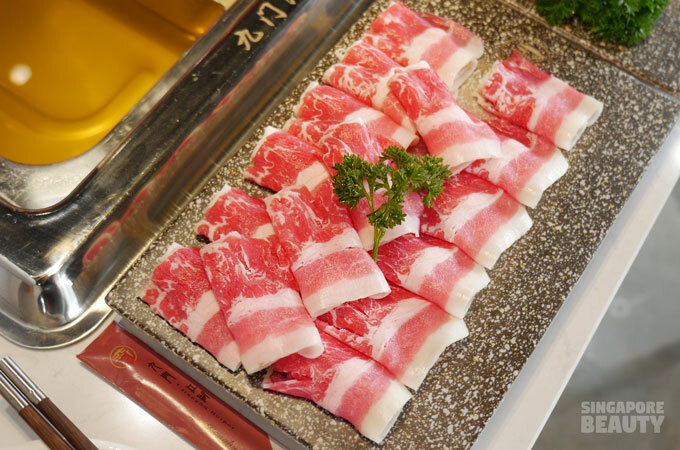 Mixed meat combo consists of shabu shabu meat in its naked glory. 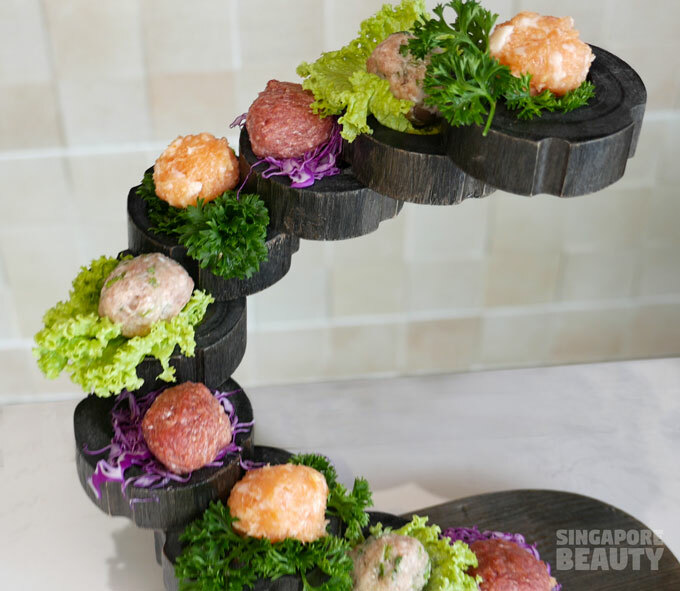 These mixed combo is served in a three-tiered high tea set with meat (beef, pork and lamb) instead of pastry. The meat cooks quickly with 3 swaps in the hot soup base. 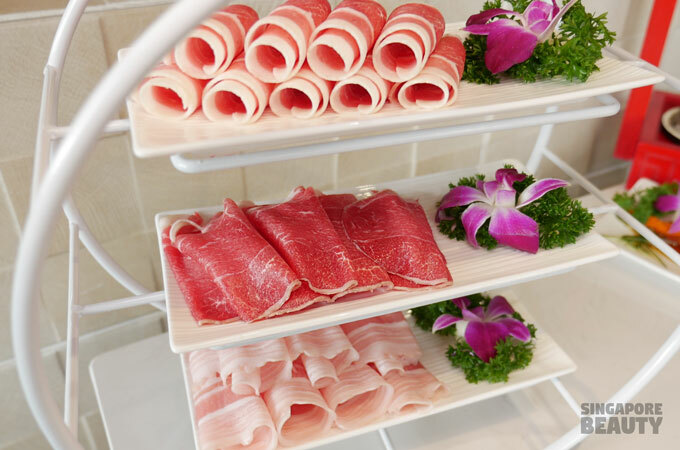 US prime beef slices – These ribbons of meats when cooked, curls into a springy cluster and melts in your mouth without much chewing. 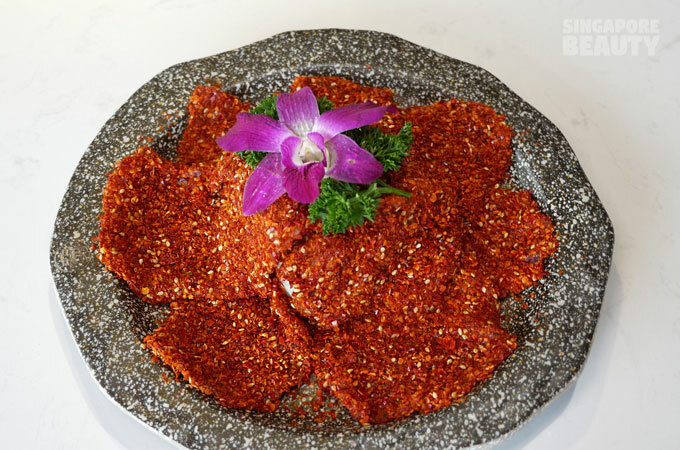 Chilli beef slices – This is a volcano of beef slices coated in chilli, sesame seed and grounded spices. Looks intimidating but in actual is well marinated tender cuts of beef that is springy when cooked with a little spicy kick to it. The signature Mala soup base is a clear golden chicken broth topped with pure vegetable and chilli oil extract. According to the service crew, the pure vegetable extract oil is healthier and less greasy. 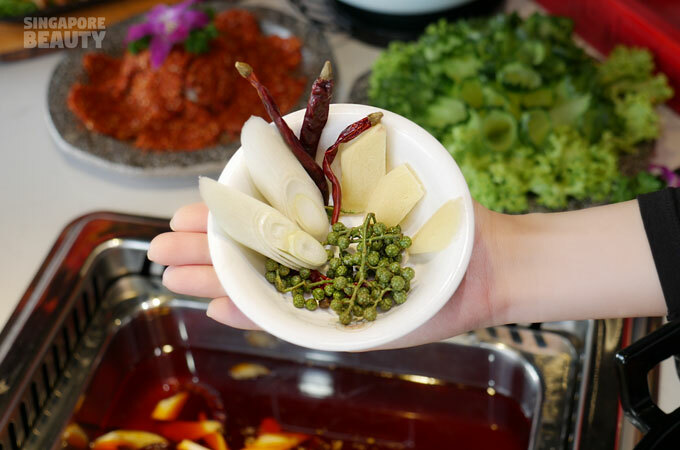 A cluster of fresh green peppercorns, leeks, ginger and dried chilli pepper that gives off a savoury aroma of a Sichuan style hotpot. 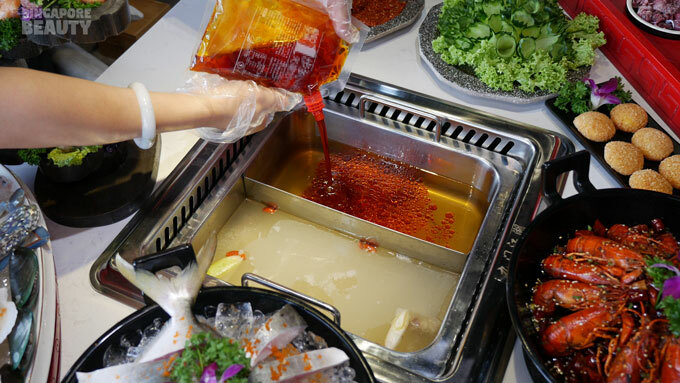 The Mala soup base is a crystal clear and fiery red broth that glisters in the light like red rubies gemstones. Soup base is light and flavourful to complement your favourite ingredients without being overpowering. 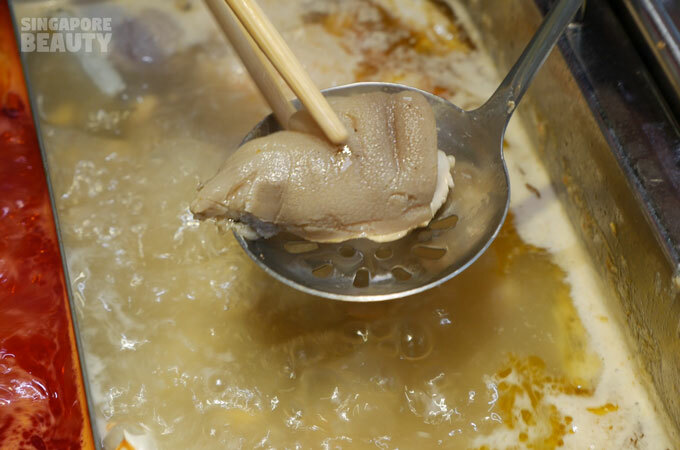 The other soup base is a pig’s trotter soup with a silky collagen texture and creamy taste. 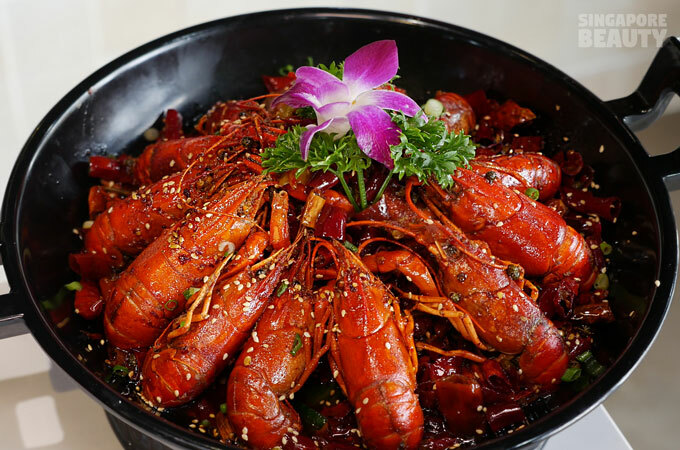 Mala crayfish – These crayfish/crawfish are sautéed in hot mala sauce peppered with dried chilli, ginger, scallions, coriander, peppercorns, roasted sesame seeds, hot chilli oil and some other seasoning. 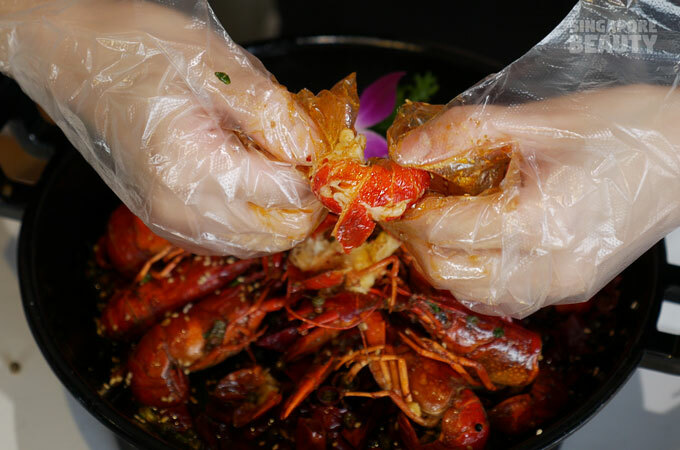 The crayfish are butterflied for the spices to be fully infused into the crayfish and for ease of consumption. Disposable hand gloves are provided and packaged like a piece of condom. Pardon my crudity. These extremely addictive morsel of firm but crunchy yabbies are intensely flavourful. The texture of these crayfish has striking similarity to baby lobsters. 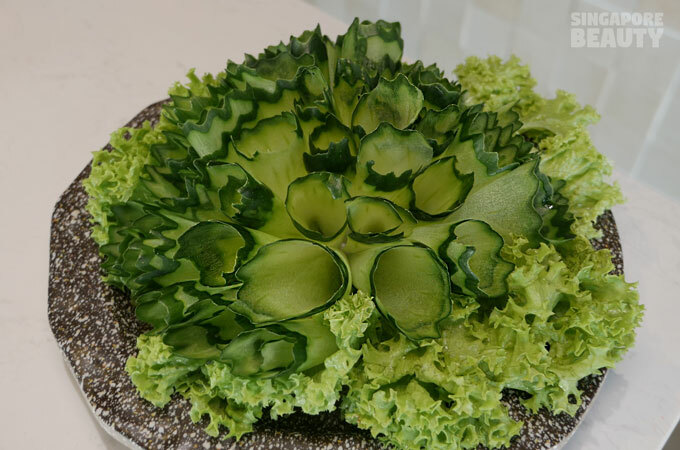 Cucumber roll – This bouquet of cucumber are ribbons of paper thin cucumber and good for a quick dip into the soup. The cucumber retains its refreshing crunch and at the same time is coated with the flavours of the soup to remove the earthy green taste of cucumber. Pumpkin balls – These are crispy on the outside, mildly sweet and chewy on the inside with pumpkin fillings. 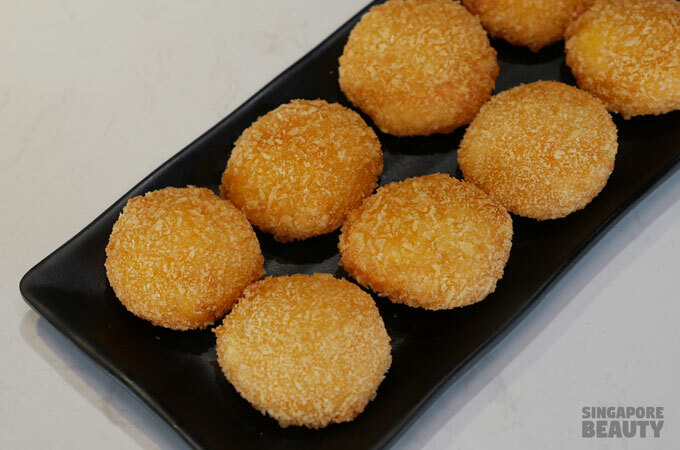 Similar to panko fried rice cakes but these does not stick to your gums and is delightful to eat. 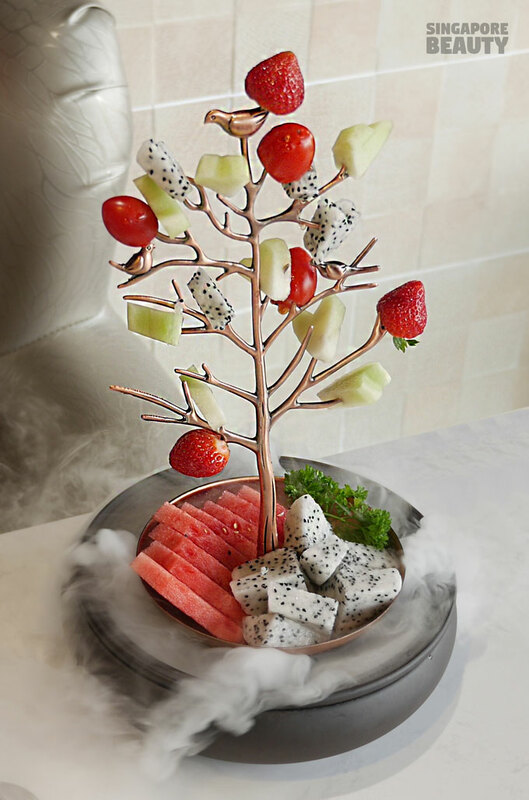 Fruit tree – an assortment of fruits cut and served on a smoking pot. Pluck your berries and fruits off the tree and enjoy! 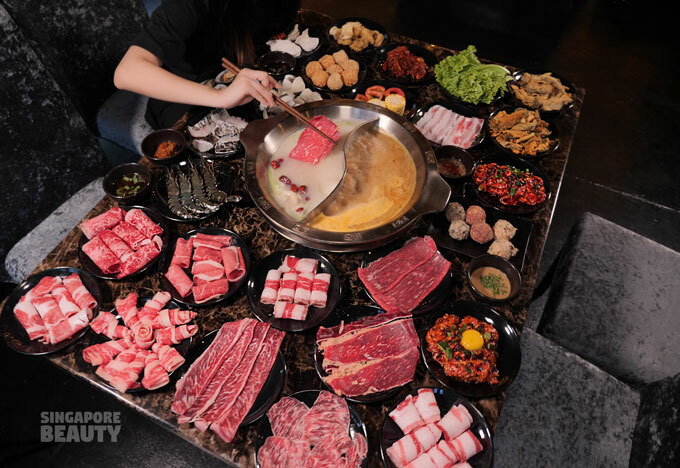 With so many food choices, head over to JiangHu Hotpot today. 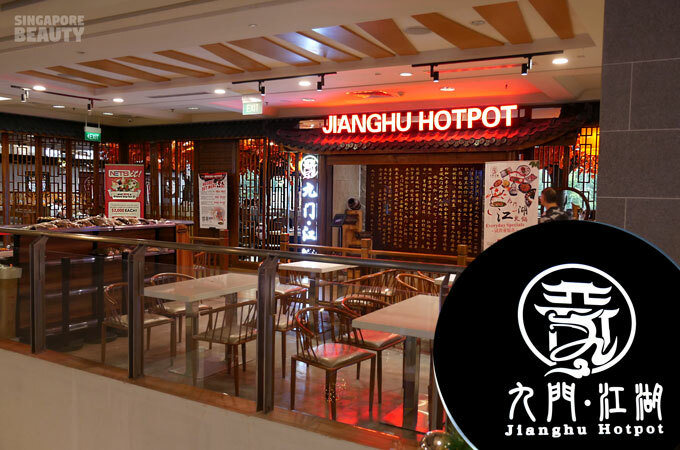 JiangHu hotpot is conveniently located in Bedok Point Shopping Mall next to Bedok Mrt station. 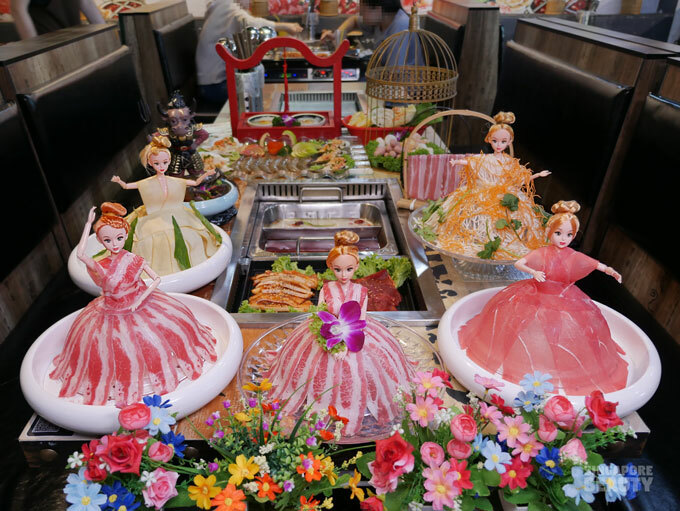 Call now to make a reservation or simply walk in for a brand new Sichuan hotpot experience with interesting interior architectural décor, food presentation, arcade games, tea appreciation corner and even a minimart. 4mins walk from Bedok MRT station. 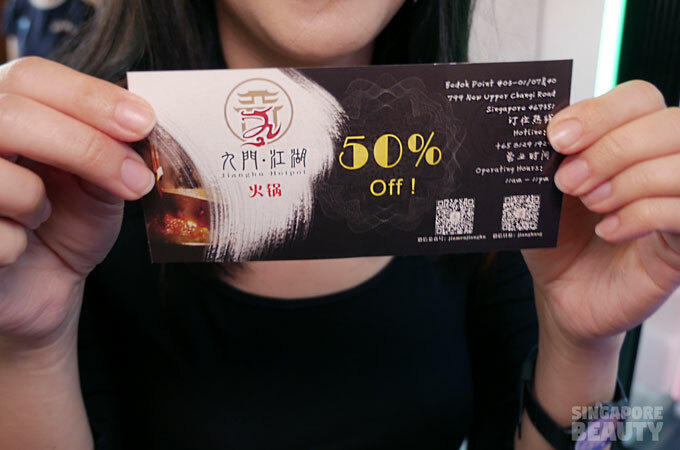 Restaurant is already opened but they have an Official Grand Opening Special on 30Nov. 30Nov to 2Dec = Get $1 return voucher for every $1 spend. Meaning if you spend $100, you get a $100 voucher for your next visit!